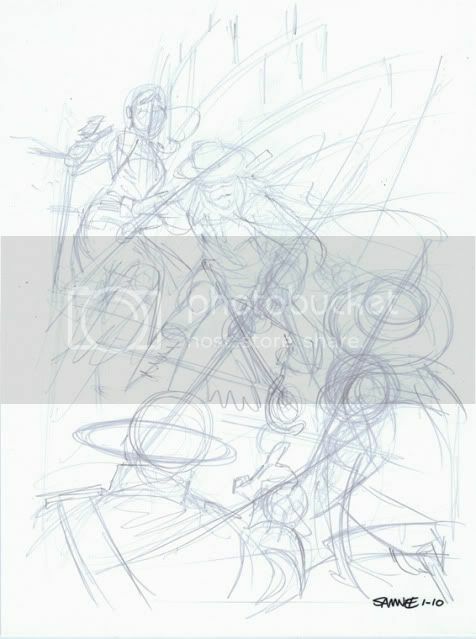 Above are the pencils to my finished Zorro sketch that can be found over on the Comic Twart blog. The contrast has been turned up quite a bit here, for the sake of clarity, since I tend to pencil so lightly. "Twart" as in ART made by a group of folks that are on Twitter. Twitter+art=Twart. Get it? Anyway, each week one of the artists will pick a subject and all of the crazy talented gentlemen will do their own take on said character. There are already some great pieces up on the blog. Go have a look! If the standard is this high every week, I'm going to have to sack off paying work to focus on my Twart! Great Zorro Chris! Thanks for posting the pencils here...the final inked piece is brilliant. The new Twart site is off to an incredible start...Kudos! Big Zorro fan, so that was a real nice surprise on a monday. You're an over-achiever, Mr. Samnee. Although all the postings were topnotch (Andy's was particularly nice as well), your layout and level of detail really out-distanced the other (very talented) participating artists on today's Twart post. A great collaborative showing thus far, gang! Dan: As much as I look forward to seeing your sketches up on the blog, don't EVER stop drawing paying work. You're a brilliant storyteller, sir, and I look forward to many a year of your great funnybooks in the future. Brian, Brian and Matt. I have 3 high-fives. Each has one of your names on it. Remind me to give 'em to you when I see you, okay?